Fenugreek seeds are soaked in water for few hours and ground into paste. It is then mixed with rice flour and sour yogurt to form somewhat thick batter. The batter is poured onto hot pan into thin dosa and cooked until done. 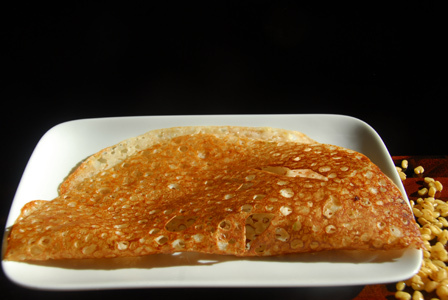 Serve fenugreek seeds dosa with sambar or with any chutney of your choice. Makes: around 4 Servings of Fenugreek Seeds Yogurt Dosa. Soak fenugreek seeds in water for around 4 – 5 hours. Once soaked, grind the fenugreek seeds into paste adding enough water. Remove stems, wash and roughly chop green chiles. Grind green chiles with a pinch of salt into coarse paste using a grinder. In a mixing bowl, mix together rice flour, ground fenugreek seeds paste, sour yogurt, cumin seeds, green chile paste, 2 cups of water and salt. Add another half cup of water if necessary to make into somewhat thick batter. (consistency thicker than rava dosa batter). Heat a flat pan on medium high heat, apply few drops of oil with back of a spoon. When pan gets hot, pour a ladle full of fenugreek seeds dosa batter on pan in circular motions. Make sure batter is thin enough that it makes small holes when batter hits the hot pan. Try to fill up any big holes and form into around 6 inch diameter dosa. Don’t spread the dosa with back of the ladle even if necessary. Fry on low – medium flame till bottom side starts to turn golden brown. Pour few drops of oil around the dosa and turn on other side. Reduce the heat a bit and cook on this side for around half a minute before removing from heat. Repeat the same with any remaining fenugreek seeds dosa batter. Serve fenugreek seeds dosa with sambar or with any chutney of your choice. Notes: Make a fresh batch of dosa batter when necessary. Don’t store the batter for later use. Suggestions: Don’t make this recipe unless you have a decent sour yogurt at hand. If dosa is thick, add few tablespoons of water to batter. If dosa sticks to bottom of pan, add a tablespoon or so of rice flour to the batter. Variations: Check other dosa varieties here. Other Names: Fenugreek Seeds Yogurt Dosa, Challa Attu. 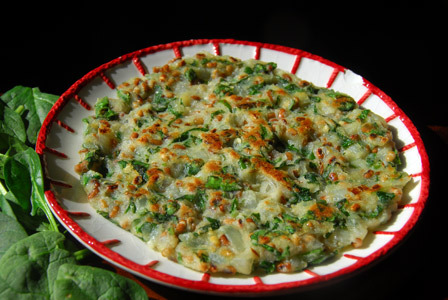 Rice flour is mixed with hot water along with soaked moth beans, chopped spinach and spices. The freshly prepared dough is spread on flat pan into thick rotti and fried till its golden brown on both sides. Serve rice flour moong dal rotti with simple garlic pickle or with any chutney or pickle of your choice. Makes: 2 Spinach Moth Beans Rotti. Soak moth beans in a cup of water for around 6 hours or overnight. Wash and finely chop the spinach leaves. Bring to boil a cup of water, add moth beans and salt and remove from heat. Stir in rice flour, chopped onion, green chiles, cumin seeds and salt. Make a smooth dough out of the mixture and add few drops of water if necessary while making the dough. Divide the dough into two portions. Heat a flat pan on medium heat. When pan gets little warm, place the dough on the flat pan. Press the dough and spread it with help of wet fingers into thick roti (around 7 inch diameter). Pour a tsp of oil on top of the roti. Cook for a minute or two until the bottom side turns light golden brown. Turn on the other side and cook covered for a minute or two. Uncover, turn again and cook for couple more seconds to crisp up the bottom. Remove rotti from heat and repeat the same with remaining portion(s). Serve spinach moth beans rotti with simple garlic pickle or with any chutney or pickle of your choice. Notes: Make sure to cook the rotti well. Suggestions: If the rotti is still sticky inside, put it back on heat and cook on low flame till little crisp and well cooked . Other Names: Spinach Moth Beans Rotti, Palakura Bobbarla Rotti. Fenugreek seeds are soaked in water for few hours and ground into paste. 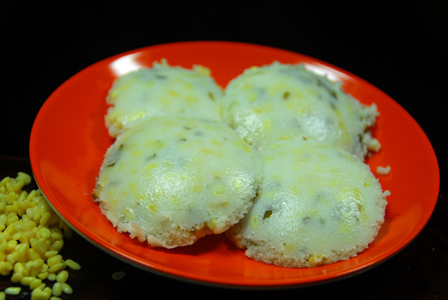 It is then mixed with idli batter and the batter is poured into idly molds and steamed till soft. Serve fenugreek seeds idli with coconut chutney or with any chutney of your choice. Makes: around 4 Servings of Fenugreek Seeds Idli. In a mixing bowl, add idli batter, idli rava, ground fengreek seeds paste and salt. Mix thoroughly and add water to the idli batter if necessary. Leave the batter aside for atleast 15 minutes before using. Grease 2 plates of idli moulds with few drops of ghee. Pour few tablespoons of fenugreek seeds idli batter in each idli mould. Place the idli stand inside a steamer. Steam the idli for around 8 – 10 minutes. Leave the idli outside for a minute or two to cool down. Carefully remove the idli from idli mould with help of a spoon. Serve fenugreek seeds idli with spicy idli powder or with coconut chutney. Notes: Make sure idli is steamed well before removing from heat. Suggestions: Adjust the amount of fenugreek seeds paste if necessary. Make sure idli batter is not too thick or not too thin. Adjust the batter with water if necessary. Variations: Check other idli recipes here. Other Names: Fenugreek Seeds Idli, Menthi Ginjala Idly. Moong dal is soaked in water till soft and is mixed with idly batter. The batter is then poured into idly moulds and steamed till soft. Serve moong idli with coconut chutney or with any chutney of your choice. Makes: around 2 Servings of Moong Idly. Soak moong dal in water for few hours until it bites through easily. Wash and finely chop cilantro leaves. In a mixing bowl, add the idli batter, soaked moong dal, cumin seeds, cilantro leaves and salt (if necessary). Mix thoroughly and add water if necessary and keep aside. 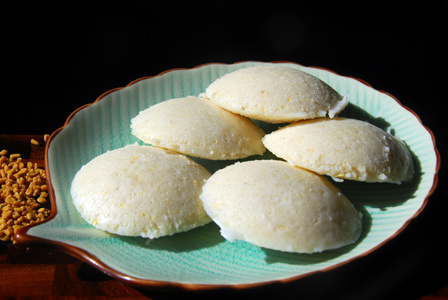 Grease idli moulds with few drops of ghee. Pour few tablespoons of moong idli batter in each idli mould. Place the idli stand in steamer. Steam the moong idli for around 8 – 10 minutes. Serve moong idli with coconut chutney or with any chutney of your choice. Notes: Make sure moong dal is soaked really well before adding to the idly batter. Suggestions: Make sure idli batter is not too thick or not too thin. Adjust the consistency of the idli batter with water if necessary. Variations: You can also add finely chopped ginger into the idly batter. Check other variations of idly here. Roti batter is prepared with idly rawa and urad dal. The batter is then fermented and mixed with fresh fenugreek leaves and spices. It is then poured onto flat pan into thick rotti and cooked till lightly crisp. Serve fenugreek leaves rotti immediately. Thoroughly wash and finely chop the fenugreek leaves. Remove stems, wash and finely chop green chiles. Soak urad dal in water for 3 hours. Grind the soaked urad dal into smooth paste adding sufficient amount of water. Soak ildy rawa in water for couple of minutes and squeeze the excess water out of it and keep aside. Mix together urad dal paste, soaked idly rawa and salt thoroughly. Add water to not make the mixture thick and gooey. Leave the dosa batter in a warm place for around 8 hours. In a mixing bowl, add chopped fenugreek leaves, green chiles, cumin seeds and salt. Stir in fermented dosa batter and add water if necessary to make slightly thin dosa batter. Heat a flat pan on medium heat, pour 2 ladles of batter on the pan. 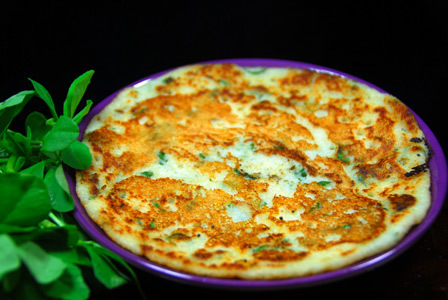 Spread the batter into thick 5 – 6 inch rotti. Cook covered for around 5 minutes on medium – low flame. Uncover, pour a tsp of oil and turn over the rotti. Cook the roti for another 2 minutes on a low flame for it to crisp up a little. Serve fenugreek leaves rotti immediately with coconut chutney or with sambar. Notes: Refrigerate the remaining batter if necessary for later use. Stays fresh for a week. Suggestions: If rotti is uncooked inside, put it back on heat and cook covered on low flame till done. Variations: Check other rotti recipes here. Other Names: Fenugreek Leaves Rotti, Menthi Aku Minapa Rotti.